Welcome to another edition of Meet the Guys Monday! Today features .. Jonah! (say hello to Jonah!) Isn't he the absolute cutest? N has a friend who lives in Canada, and we used to ship each other Christmas presents (before a child bankrupted us!) and one year, at Clintons or some other major greetings card shop, I fell in love with this adorable polar bear! I couldn't believe how much I coveted his scarf with the blue stars and the furry little balls at the ends. And his fur and paws are so soft, I wanted him. 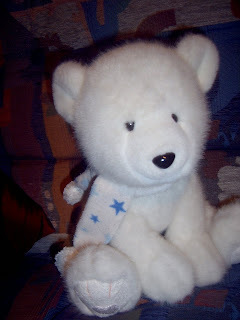 But at the time, N gave a reasonable sounding argument against buying one for ourselves and we walked out of the shop with just the one polar bear as a gift for Canada-girl. I felt a bit down. I fall in love very easily with stuffed animals, and this was love-at-first sight for me, I didn't walk away easily. Christmas came around, and I could tell N had some fun surprise for me... What he likes to do (but I try not to count on it!) is he'll spread my gifts (this happens at birthdays as well as Christmas) into .. installments, if you like. He'll give a few presents in the morning, maybe some more after we've gotten home from whatever we've done on the day, and then something (usually something extra-special, I'm so incredibly spoilt!) just before I fall asleep. And so, for Christmas forever ago, my extra-special Christmas gift was my Jonah. N named him (he names all The Guys except those who already had names) It was just a name we both really liked and it seemed to suit the extra-cute polar bear! Nicknames include: Jonah Lomu and Jonah Bearah. aw. how cute! i've really enjoyed your MTGM's.